Don’t be intimidated by eBay, because it’s very easy to get started selling some things you already have laying around your house. My sister just started selling on eBay and she inspired me to contact Suzanne about writing a guest post for my blog. A great way to get started is by reading this free guide – written by a mom especially for other moms: Stay-At-Home Mom’s Guide to Successful eBay Selling. It’s a free downloadable PDF guide written by Suzanne Wells, who is an expert at selling on eBay and blogs at eBay Selling Coach. She was kind enough to write this guest post to give my readers some more information about how to get started selling on eBay. Money is on everyone’s mind right now – no one seems to have enough of it yet we all need it more than ever. What if you had items in your home right now that you can sell on eBay for cash? If you’ve never sold on eBay, now is the time to give it a try. You don’t have to buy a starter kit, take a class, or have a business license. Here are a few things that you might have lying around that can bring some good money on eBay. And just think, you don’t have to drag any of it out to the driveway for a yard sale on a Saturday morning. Kitchen items. Anything that was expensive new is a good seller in gently used condition. Items such as Calphalon, Pampered Chef, Kitchen Aid, Tupperware, and casual china such as Pfaltzgraff are all good sellers. You’ll get the most for larger pieces. Pull out those wedding gifts that you received years ago and have never used. If you’ve got any vintage items like Pyrex bowls, Griswold cast iron, or Fire King items, those are highly collectible and you can make a good profit on them. Cosmetics, makeup, and perfume. Empty those drawers and tubs full of unopened makeup you have in your bathroom and sort through it. Gather up those cosmetics and sell them in a lot or a batch. As long as makeup is new in the package and unopened, there is a buyer for it on eBay. You know all those samples and free gift items you’ve picked up from the counter at the mall? You can sell those, too. Perfume is another story – it sells well even if partially used. Expensive designer perfumes sell well. I can’t tell you how many times I have bought partially used perfumes at garage sales or thrift stores for $1 and then sold them on eBay for $20 or more. It still smells the same whether the bottle is full or half empty. There is a huge market for children’s clothing on eBay. Expensive lines like Gymboree, Janie & Jack, and Boden are all good sellers. Even lesser expensive brands sell well in lots as play clothes. You can sell your children’s clothes in a lot on eBay once they have outgrown a particular size. Click here for a podcast with detailed information about how to make money selling children’s clothing on eBay. Baby items. Intercom systems, feeding accessories, infant learning toys, crib bedding, breast pumps, and nursery décor all do well. Larger items like cribs, strollers, high chairs, portable play pens, baby bath tubs, and walkers, can be sold on eBay with “local pickup only.” You can also sell these on Craigslist free of charge. If you have older children, you’ve got computer and video games. Playstation, Wii, XBox, Gameboy, and CD ROM games are consistently good sellers. Hang on to the boxes and plastic covers – you’ll make a better profit when selling them. You can also sell these in a lot or a batch for quick and easy cash. Video games are lightweight, easy to ship, and easy to photograph. There are so many items you can sell on eBay, the list is endless. Here are a few more ideas for profitable items that you might have in your home right now. ay Seller Audio Tour. eBay is easy and user friendly by design – millions of people sell on eBay every day and you can, too. Next you will need to know how to price your items. Click here for step by step instructions on how to price your eBay items to sell. Before you list your item, you will need to figure out how much to charge for shipping. The buyer pays the shipping fee, but you will need to calculate the cost first. Click here for step by step instructions on how to charge for shipping on your eBay items. 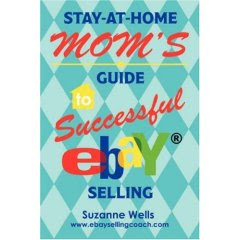 For more tips on what to sell and how to use eBay, click here to download my free “Stay at home Mom’s Guide to Successful eBay Selling.” This is the same book that is available on Amazon for $9.95, but instantly accessible in eBook format, and it is free! Thanks for the tips. I sell at a local mommy sale, but I always have stuff left over. Ebay would be a great place to get rid of some of those things. THANK YOU so much! I have just started looking into selling on e-bay, so this couldn’t have come at a better time. God bless you! Thank you for the post.. I downloaded the ebook by Suzanne to hopefully improve my skills for selling on ebay. Suzanne’s ebook is wonderful and I encourage everyone to download a copy. It is a wealth of information, tips, encouragement and motivation! I am looking forward to getting started on my ebay store. Love it! I just finished reading the e-book last week and have been busy going through podcasts and her blog before I jump in and sell anything, but I’m so glad she’s featured on on of my favorite blogs!